Registration – Only coaches need to register at the Registration Tent. Plan to check-in at least 30 minutes prior to your first game in case there are lines. Support our Sponsors and Vendors — Our sponsors & vendors have contributed significantly to making the Jamborees a success. Please support them and visit their booths. Parking - There is plenty of parking for our visitors. MBGLL will post signs at the available lots. Please do not park illegally. The police will regularly patrol the area and ticket/tow illegally parked cars. Handicap parking is available in the Official's parking lot. 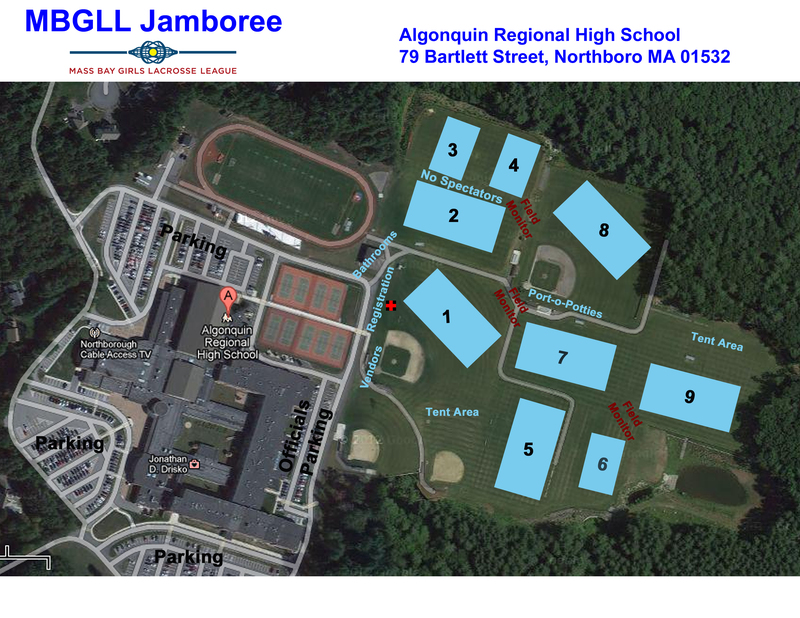 Threatening Weather — MBGLL’s Jamboree will take place unless the weather is REALLY bad or playing will damage the fields. Check this website for the latest schedule information in case of bad weather. It will have up-to-the minute information. Please don't call the site managers...with a total of 180 teams and almost 4,0000 girls playing, they are not able to handle the load. Team Sizes — U13 and U15 teams will play 12v12. U9 and U11 teams will play 7 v 7 with an optional goalie. Tent Area – There are a couple of different areas where teams may set up tents. Because of safety concerns, we ask that you not use grills at the facility. Pets – You may bring dogs to Northborough but please carry plastic bags with you to clean up after them. We don’t want our players to step in any surprises with their cleats. All pets must remain on leash at all times while on-site.